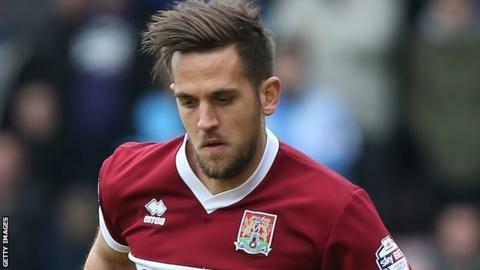 Darren Carter rescued a point for Forest Green Rovers at Gloucestershire rivals Cheltenham Town in the National League's top of the table match. Harry Pell put league leaders Cheltenham in front with a free-kick which went under the jumping wall. Rovers were given a penalty after Rob Dickie fouled Kurtis Guthrie in the box, but Jon Parkin fired over the bar. However Carter tapped in from close range to make sure the gap between the two sides remains just one point. "We can play better than that, but there's a spirit not to get beaten. "Nobody is giving up and everybody is disappointed when you have drawn with a team that are second in the table behind you. "Both teams have gone away with one point, so, credit to both teams because it was a battle." "I'm just very pleased with the character we showed coming back, to miss that penalty, heads do go down, but I thought we played very well today." "Cheltenham are very strong on set plays and I thought it was a sloppy free kick to give away and I will have to look and see what the wall's doing." "We are on a very good run at the moment, and I'm pleased with the football we are playing and I am very pleased with the character of the lads and it was just a shame we didn't get the three points." Match ends, Cheltenham Town 1, Forest Green Rovers 1. Second Half ends, Cheltenham Town 1, Forest Green Rovers 1. Hand ball by Kurtis Guthrie (Forest Green Rovers). Substitution, Cheltenham Town. Lee Vaughan replaces Danny Parslow because of an injury. Substitution, Forest Green Rovers. Aaron O'Connor replaces Jon Parkin. Attempt missed. Darren Carter (Forest Green Rovers) right footed shot from outside the box misses to the left. Attempt blocked. Darren Carter (Forest Green Rovers) right footed shot from outside the box is blocked. Harry Pell (Cheltenham Town) hits the bar with a right footed shot from the right side of the box. Offside, Cheltenham Town. Ryan Jennings tries a through ball, but Ryan Jennings is caught offside. Goal! Cheltenham Town 1, Forest Green Rovers 1. Darren Carter (Forest Green Rovers) left footed shot from the left side of the six yard box to the top right corner. Assisted by Jon Parkin. Substitution, Cheltenham Town. Ryan Jennings replaces Jack Barthram because of an injury. Penalty missed! Bad penalty by Jon Parkin (Forest Green Rovers). Jon Parkin should be disappointed. Penalty conceded by Robert Dickie (Cheltenham Town) after a foul in the penalty area.